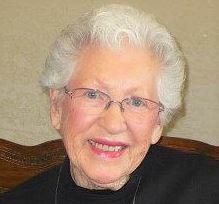 Bobbie Lee Bechtel, 95, passed away at her home in Newton on Thursday, January 17th, 2019. Bobbie was born on January 9th, 1924 in Viola, Arkansas to George and Amy LeVicie (Chadwick) Spurlock. Bobbie married Norman W. Bechtel on June 27th, 1948 in Wichita, Kansas. They were married for fifty-seven years until his death in 2005. Bobbie was an independent lady, a compassionate caregiver for her father and husband, and a very friendly and gregarious person. She attended First Mennonite Brethren Church in Wichita for many years where she enjoyed serving in the Wednesday evening meal ministry. Bobbie enjoyed waterskiing, camping, and playing tennis with Norman. Following Norman’s death, she moved to Newton, KS where she attended Meridian Baptist Church. She enjoyed eating out and drinking coffee with friends but most of all she loved being with her grandchildren and great-grandchildren. She was a tremendous cook and enjoyed hosting family gatherings. She regularly whipped up big family dinners into her nineties, including homemade ham loaf, zwieback and the best cherry pie anywhere. She is survived by her daughter: Sherry Clark (Spencer); grandchildren: Evan (Julie) Clark, Adrian (Abigail) Clark, and Tristan Clark; and four great-grandchildren (Darcey, James, William, and Carmen). She was preceded in death by her husband: Norman W. Bechtel; parents: George and Amy LeVicie Spurlock; siblings: Alfred, Mary, David, and Lois Spurlock. A public visitation will be from 5:00 to 9:00 p.m., Monday, January 21st at Petersen Funeral Home. A graveside committal will be held at 2:00 p.m., Tuesday, January 22nd at the Halstead City Cemetery. A memorial service will be held at 3:30 p.m., Tuesday, January 22nd, 2019 at Meridian Baptist Church in Newton. In lieu of flowers, memorial gifts may be made at petersenfamilyfuneralhome.com. Donations will support of the mission work of Holly and Grady Nace with Mission Aviation Fellowship.